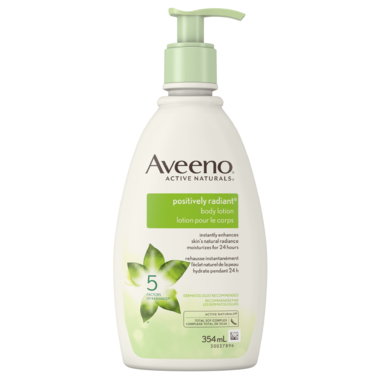 Replenish dull, dry skin with Aveeno Positively Ageless Body Lotion. Enriched with ACTIVE Naturals Total Soy Complex, this body lotion harnesses the power of natural light diffusers to immediately enhance your skin’s natural radiance. The hypoallergenic formula moisturizes your skin for up to 24 hours and leaves it feeling softer and more moisturized after just one use. Positively Ageless is a collection of skincare products uniquely formulated to target all 5 Factors of Radiance--tone, texture, dullness, blotchiness, and brown spots--to leave your skin looking fresh, awake and luminous. Instructions for Use: For radiant and healthy-looking skin apply liberally at least once a day or more often if needed. For soft, smooth skin, try Aveeno Positively Ageless Exfoliating Body Wash prior to application. Ingredients: Water (eau), Mineral Oil, Glycerin, Glycine Soja (Soybean) Seed Extract, Petrolatum, Stearic Acid, Dimethicone, Stearyl Alcohol, PEG-100 Stearate, Glyceryl Stearate, Phenoxyethanol, Parfum, Hydroxyacetophenone, Ammonium Acryloyldimethyltaurate/VP Copolymer, Acrylates/C10-30 Alkyl Acrylate Crosspolymer, Sodium Hydroxide, Ethylhexylglycerin, Disodium EDTA, Silica, Mica, Titanium Dioxide.